Log in to the members area to access Fastcase, check and certify MCLE attendance, edit your address (including telephone number, fax number, and email), opt-out or opt-in to the Virginia Lawyer Directory, and download dues statements and other forms. Newly Licensed by Bar Exam— What Now? 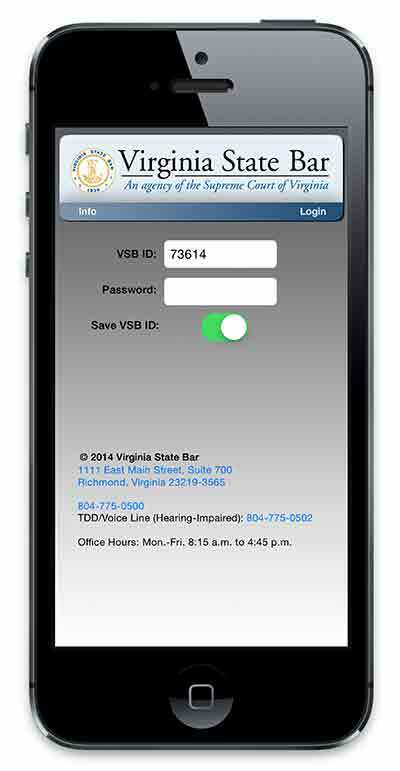 EVERY person licensed by the Virginia Board of Bar Examiners is REQUIRED to register with the Virginia State Bar. Go to New Member Requirements. All members of the Virginia State Bar have annual membership requirements that include: payment of membership dues, payment of a Clients’ Protection Fund fee, and certification of professional liability insurance. These obligations are included on an annual dues statement, which is mailed each June. Failure to meet these obligations by July 31 will result in delinquency fees and possible administrative suspension pursuant to Paragraph 19 of the Rules of Court. See Part 6, Section IV, Rules of Supreme Court of Virginia, Organization and Government. The Virginia Supreme Court requires that each active member of the Virginia State Bar annually complete a minimum of twelve hours of approved continuing legal education courses, of which at least two hours shall be in the area of legal ethics or professionalism, unless expressly exempted from such requirement. The requirement must be met by October 31 and the reporting deadline is December 15.